The Goodman Theatre is a professional theater company located in Chicago's Loop. A major part of Chicago Theatre, it is the city's oldest currently active nonprofit theater organization. Its present building occupies the site of landmark Harris And Selwyn Theaters property. The Goodman was founded in 1925 as a tribute to the Chicago playwright Kenneth Sawyer Goodman, who died in the Great Influenza Pandemic in 1918. The theater was funded by Goodman's parents, Mr. and Mrs. William O. Goodman, who donated $250,000 to the Art Institute of Chicago to establish a professional repertory company and a school of drama at the Institute. The first theater was designed by architect Howard Van Doren Shaw (in the location now occupied by the museum's Modern Wing), although its design was severely hampered by location restrictions resulting in a lack of space for scenery and effects and poor acoustics. In 2000, the company moved into its new building at 170 N. Dearborn in Chicago's theater district. It has two fully modern auditoriums, named the Albert and the Owen, after two members of the Goodman family who continue to be major donors. In August, Associate Artistic Director Michael Maggio died and they renamed the Michael Merritt Award for young designers the Michael Maggio Emerging Designer Award in his honor. Here's the our members favorite photos of "Theaters in Chicago". 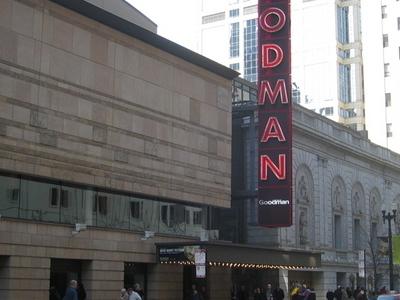 Upload your photo of Goodman Theatre!